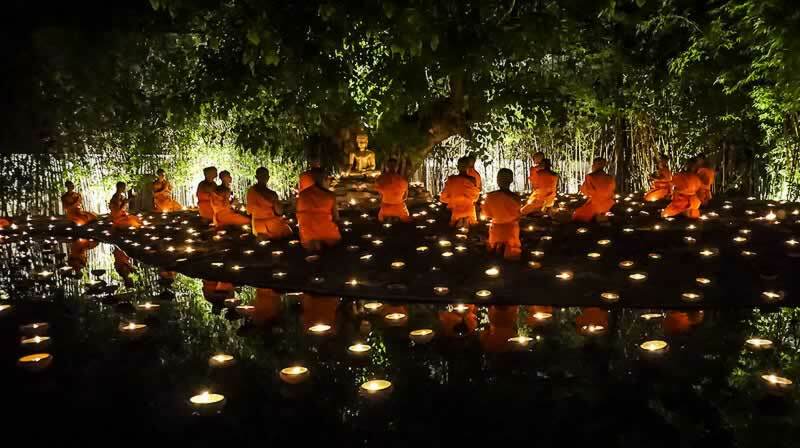 Visakha Bucha Day (Visakha Puja) – There are three very important occasions on the Thai Buddihst calendar, with the Asahara Bucha observing the day the Lord Buddha preached his very first sermon. Makha Bucha marks two special occasions, which saw 1,350 disciples gather without any notice and listened to the Buddha impart some of his most important teachings in an address, on this day he also foresaw his own death and attainment of Nirvana. The third important day on the Buddhist calendar here in Thailand is the most auspicious of the three and is called is Visakha Bucha day. This very special anniversary simultaneously venerates the three most important anniversaries in the life of Siddharta Gautama, the Lord Buddha: his birth, his enlightenment, and his death. Visakha Bucha day or Vesak Day is also widely known as Buddha Purnima and Buddha Day, and is celebrated throughout the Buddhist world albeit on differing days of the year. Some of the countries where this day is celebrated by traditional Buddhists include: India, Thailand, Laos, Myanmar (Burmah), Vietnam, Indonesia Sri Lanka, Nepal, Tibet, Cambodia. Over 2543 years ago and 80 years after his birth to the very day The Lord Buddha passed from this life. On that day, (incidentally 543 years before Christ), the Buddha attained the definitive goal of amalgamating his enlightenment with Nirvana, thus freeing himself for eternity from the cycle of death and rebirth (which Buddhist believe). Visakha Bucha occurs on the 15th day of the waxing moon in the 6th lunar month, 8th month on the Lanna calendar, each year that Visakha Puja is celebrated. Rejoicing Vesak similarly means taking exceptional efforts to bring happiness and luck to those less fortunate than oneself like the elderly, the hospitalized and the sick. On this day, Buddhists will offer gifts and cash and other kinds of charitable gifts to those in more trying circumstances than their own. Vesākha is also a time for great joy and happiness, as well as making use of ones skills and not being selfish by pandering to one’s own appetites. Buddhists are encouraged to help decorate their local Buddhist temple with ornate and colourful decorations and painting and generating beautiful scenes from the life of the Buddha for the public to see. In Thailand, Visakha Bucha was first perceived during the Sukhuthai period (700 years ago – Sukothai was the ancient capital of Thailand), which was established through very intimate and close religious relations with Sri Lanka. It is important to know that Sri Lankan monks would travel to travel to Thailand in order to spread the word on Buddhism these monks were highly respected. Thai monks would reciprocate this by going to study in Sri Lanka. It is now believed that these pioneering monks actually introduced this special day to Thailand upon their return. Practicing Buddhists will wake early in the morning to make merit at their particular temple. Where they can also pray to Buddha they will carry candles burn incense and buy lotus flowers in some temples. It is quite important to appreciate, this being a very important day on the Thai calendar, that all that all Schools and government offices will be closed. Also many shops, bars and restaurants are barred from selling alcohol for 24 hours from midnight to the following day at midnight. If you are in Thailand during Visakha Puja and if you would like to witness these events, then simply find out where the nearest temple to where you are staying is and go along and witness the biggest day on the Buddhist calendar -you won’t be disappointed.